BMMA – Belgian Management and Marketing Association – has the opportunity to bring to the Belgian marketing audience one of the best marketing expert and author : Joseph Jaffe. Joseph Jaffe is a multiple author, serial entrepreneur and one of the most sought-after consultants, speakers and thought leaders on marketing, innovation and change. You’ve come a long way, content marketers. Today, nearly all top-performing B2B content marketers – 90% – put their audience’s informational needs ahead of their company’s sales/promotional message. Ten years ago, when CMI founder Joe Pulizzi cowrote Get Content Get Customers, content marketing was a novel concept for many traditional marketers. That it’s a common practice now shows how much marketers have adjusted their thinking. 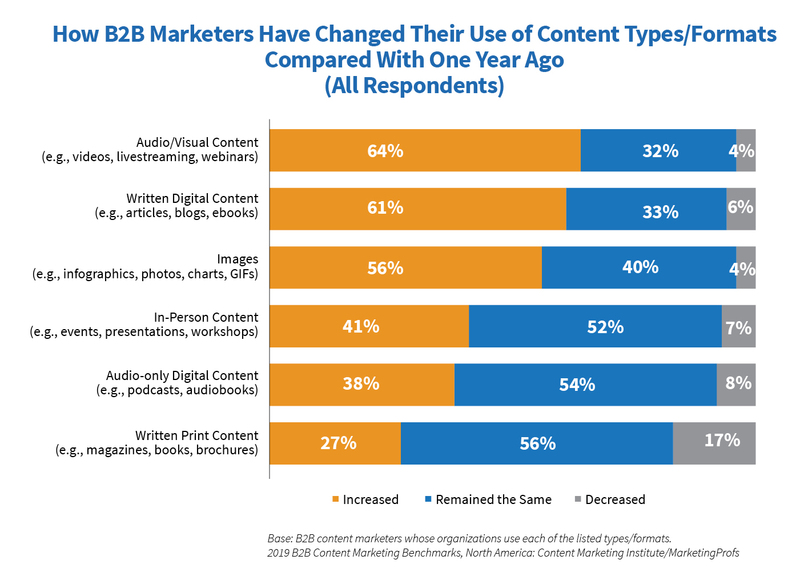 How content marketers reach those audiences, where they’re investing to do it, and what they’re most concerned about are a few of the new findings presented in CMI and MarketingProfs’ ninth annual B2B Content Marketing 2019: Benchmarks, Budgets, and Trends—North America report, sponsored by Conductor. We present the research every fall to help content marketers plan for the coming year. This year, we made a significant change in the methodology. We limited the survey to respondents whose organizations have used content marketing for at least one year. In addition, we qualified the respondents by asking them to confirm they are a content marketer, someone who is involved with content marketing, or someone to whom content marketing staff reports. This gave us a more experienced pool of practicing content marketers and, we feel, more robust insights. Here are some highlights from the 2019 report. Success in creating this bond isn’t limited to the most successful content marketers: 68% of all B2B marketers say they’ve used content marketing successfully to build credibility with their audience. In short, if you want your brand to be well-regarded by your audience, give it something valuable. Be consistent. Be easy to find. Give your audience members content they want and need – when and where they’re looking for it. And make it about them, not you. 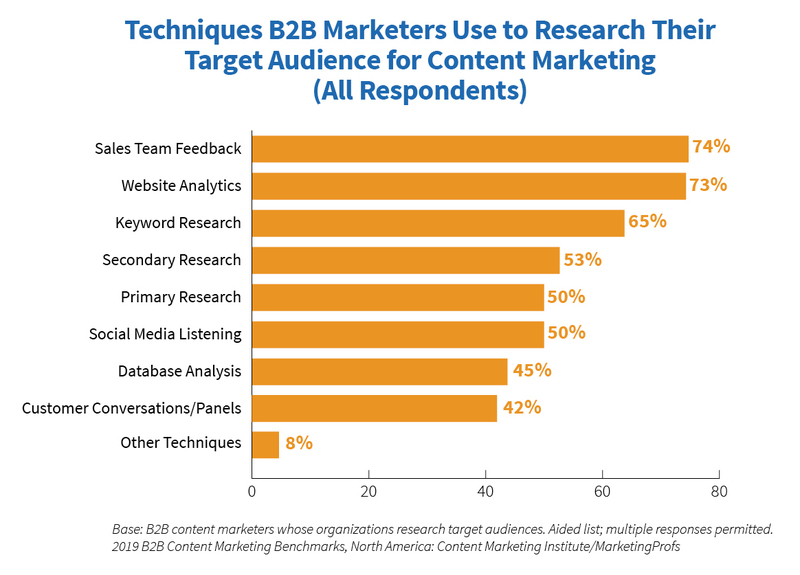 About three out of four B2B content marketers seek feedback from sales and use website analytics to research their audience, while 65% use keyword research. That’s a pleasant surprise considering how often we hear that marketing and sales teamsneed to do a better job of communicating. 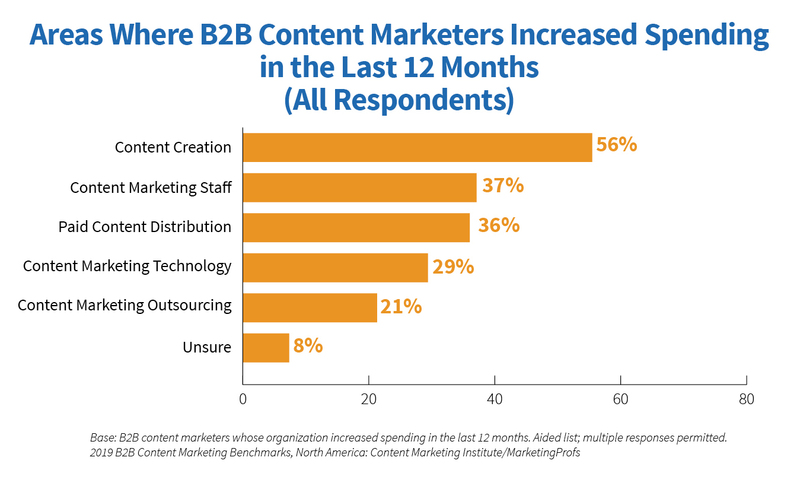 But relatively few B2B content marketers research their audience by talking to their customers. Only 42% say they have conversations with customers as part of their audience research. This year’s research also found that 73% of those surveyed use or plan to use personas for content marketing purposes by the end of 2018. Effective personas are based on research about real people. “Nothing beats the ability to get information directly from current customers,” Jodi Harris wrote in the Quick and Dirty Guide for Creating Actionable Content Marketing Personas. That’s because customers can tell you directly about their needs and preferences. You don’t have to infer them from analytics or glean them from third-party conversations. If your team isn’t talking with customers, look for ways to make this happen. Some content marketers accompany sales reps on their calls. Some arrange phone calls with prospects and customers directly. Take advantage of in-person events your audience members attend to talk to them. Fifty-eight percent of respondents say they’ve used content marketing successfully to nurture subscribers, audience, or leads in the last 12 months. 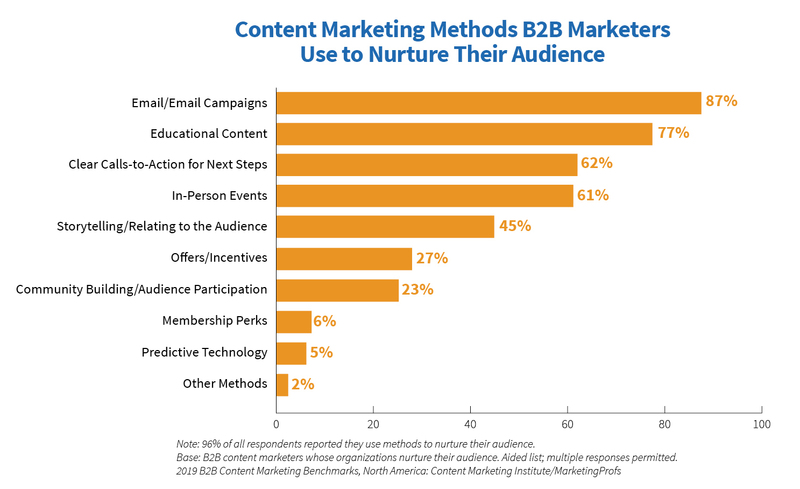 The top two methods are email (87%) and educational content (77%). Only 23% of respondents indicate their organization is working to build community among their audience or inviting audiences to participate in discussions. Email campaigns and educational content done well are reliable ways to nurture relationships. Pay attention to your audience’s changing preferences, though, to spot new opportunities. Given the fierce competition in inboxes these days, you might consider experimenting with other channels, such as the blend of email and SMS messaging, as Ardath Albee described in a talk earlier this year. Content creation is where respondents were most likely to report an increase in spending over the last 12 months (56%). Increased spending on content marketing staff came in a distant second (37%), followed closely by paid content distribution (36%). Which content types will generate the best results for your organization depends on many factors – the nature of your business, the demographics and preferences of your audience, your goals, etc. Don’t assume, for example, that content type buckets with a less than 50% increase won’t be valuable for your organization. Experimentation plays a big role in any content marketing initiative. For example, a podcast or a print magazine may be a great opportunity for your organization depending on your audience and resources. 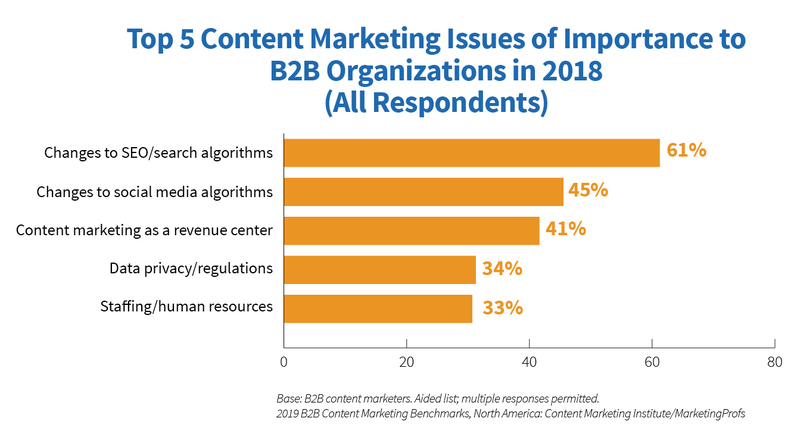 When asked about content marketing issues their organizations are concerned about, the top three answers were changes to SEO/search algorithms (61%), changes to social media algorithms (45%), and content marketing as a revenue center (41%). 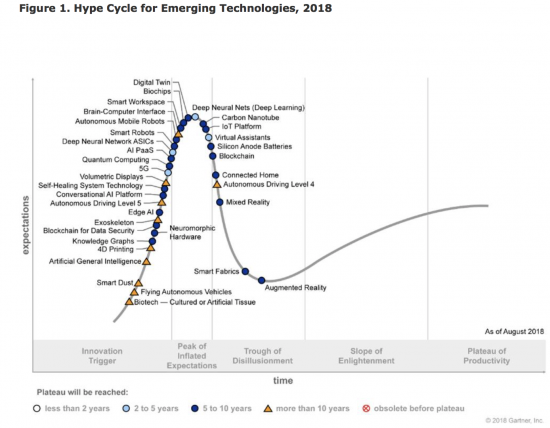 Relatively few cite emerging technologies such as artificial intelligence (14%) and preparing content for voice search (13%) as a concern, though those topics capture a lot of buzz in marketing conversations. Keeping up with changing social and search algorithms can feel like a never-ending battle. But resources that can help do exist. Earlier this year, Content Marketing World speakers shared their advice on coping with social algorithm changes. For a list of SEO resources (including experts, articles, blogs, and tools), take a look at the recap of this #CMWorld Twitter chatfeaturing SEO expert Stephan Spencer. View the report today to see all the findings and watch this blog for more analysis of the results. The programme is aimed at profesionals in communication and markerting who want to go deeper into their knowledge in marketing and/or digital communication. A perfect knowledge of English and French will be required. Courses will be given in either of these two languages. The Executive Master in Digital Marketing and Communication proposes an in-depth development of your skills in the various areas of marketing and communication. The Executive Master in Digital Marketing and Communication is a comprehensive course in marketing and communication, totally adapted to the world of digital. The Executive Master in Digital Marketing and Communication gives immediate answers to your questions, as well as practical exercises and group work tasks during the sessions. Are you interested in learning more about this 17-day program? Register for the information session to be held on 16th October 2018 from 6.30 pm at Solvay Brussels School (42 avenue Franklin Roosevelt, 1050 Brussels) – Atrium on the ground floor. Come and listen to the free talk to be given by Hugues Rey about “Revisiting Kotler’s 4 Ps through Artificial Intelligence”. While you’re there, you can ask all of your questions about the Master’s programme. This evening is completely free of charge and includes a stand-up dinner. 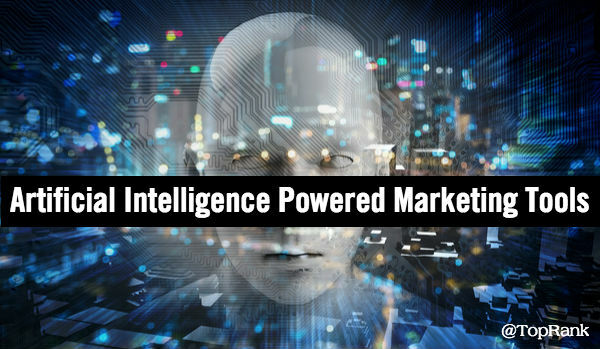 A recent survey of more than 300 marketers by Resulticks found that almost half thought artificial intelligence was an overhyped industry buzzword and 40% felt skeptical when they saw or heard the term. The survey also found that 47% of marketers believed AI was more fantasy than reality. 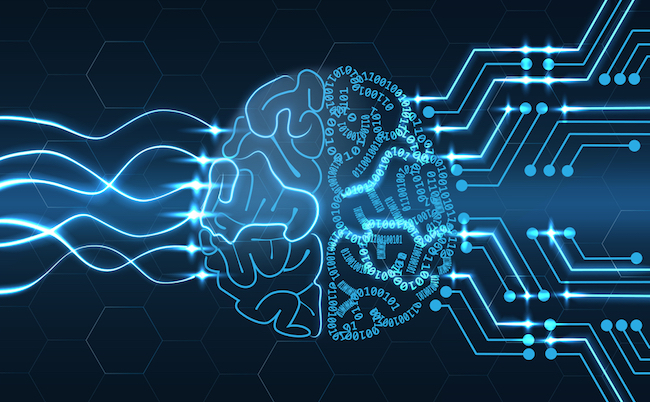 Artificial intelligence has certainly become the buzzword of 2018 as brands and retailers increasingly explore how it will impact their business this year and beyond. Speaking at an event recently hosted by StoryStream on the hype behind AI in marketing, it became apparent that whilst AI is in its infancy today, many brands and retailers are already actively using AI for the likes of content creation, content management, customer insights, personalization and customer acquisition. Brands including Aston Martin, Shiseido and Mars are already actively embracing AI experimentation in marketing and some have been at it for some time. Food producer Stonewall Kitchen re-platformed it’s entire ecommerce site with Salesforce Commerce Cloud in 2016, creating an entirely AI-driven on-site experience for their shoppers and have already been reaping the results in areas like cart abandonment and average order values. Stonewall’s Director of Marketing and Direct-to-Consumer Sales, Janine Somers estimates that AI technology has been responsible for about 10% of their year-to-date product revenue. 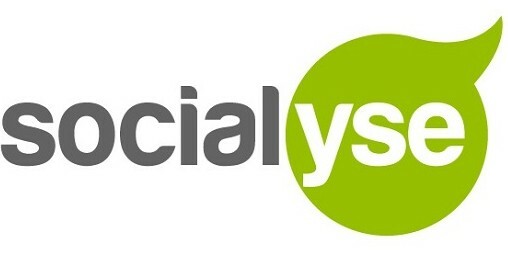 Berlin-based footwear retailer Shoepassion has seen results from utilizing the personalization technology stack Dynamic Yield in the areas of customer segmentation, optimization, messaging, recommendations and connecting the online and offline data to provide a seamless, personalized and connected customer experience at scale. Whilst beauty Start-up Wunder2 has also been experimenting at speed and recently became the first major cosmetics brand to launch an Amazon Alexa Skill. “As a business, we are fascinated with the rapid integration of AI into peoples’ lives. We think the level of adoption will exceed many peoples’ expectation, and create fluid recommendation experiences using AI technology found in Google Home, Alexa, and the recently launched Apple HomePod – it is something we are absolutely developing already,” says Co-Founder and CEO Michael Malinksy. The expectation and demands of today’s customer are increasing exponentially, whilst the overflow of content and the rising number of content sources makes it more challenging for marketers to manage their content and publish relevant content across multiple channels. CEO and Co-founder of StoryStream Alex Vaidya says, “today’s customers are ultra-connected, looking for instant gratification and searching for high-quality personalized purchasing experiences from brands.” The UK’s fifth largest retailer Co-op recently used StoryStream’s new AI platform Aura for their #nowcookit campaign across content analytics, digital asset management and multichannel publishing which saw dwell times on their website increase by up to 5x, an 11% conversion rate and an 8x improvement in content curation time for the retailer’s marketing team. Cosmetics company Shiseido use Salesforce’s Marketing Cloud and Equals 3’s cognitive companion Lucy. Their Chief Digital Officer Alessio Rossi says, “with these platforms, we are building a more complete view of who our customers are by aggregating and analyzing all the data fragments to build customer profiles that are more meaningful and actionable for us.” Whilst the digitally native cosmetics brand Wunder2, famous for having produced the Internet’s most viral brow product, has been utilizing technology from IBM Watson to do analysis on 500,000 Customer FB posts and comments to identify sentiment, allowing them to categorize posts and comments. This has given them large scale data to help understand typical concerns, questions, sources and instances of negativity and build strategies to address and pre-empt them where possible. For many, an AI approach to customer segmentation has also increased the number of segments that they look at. For example, AI has helped Magic Day’s owner Maksym Podsolonko connect the dots between requests, their proposals and customer feedback. It has also led to increasing the customer segments from 7 to 61, whilst only focusing on targeting 4 of them. This level of segmentation and precise targeting has helped them increase revenue with minimal resources making his business ultimately more efficient. In addition to segmenting existing customers, AI technology is also being used to identify new potential customers in new markets by both Aston Martin and Mars. Aston Martin recently used AI technology KanKan to identify potential customers in China. They wanted to understand the difference between a Tesla buyer and other luxury car brands and were able to do this by aggregating data from both social and retail behavior. Mars Wrigley Confectionary has been using a reply-based social advertising tool on Twitter called Respondology for their goodnessKNOWS brand to offer product incentives to new audiences outside their existing fan base. Through the platform, they’ve been able to find and vet target-right consumers and offer them a discount off their online purchases. Whilst they are still in the infancy of leveraging the platform to its fullest capability, they have already seen an increase in online ecommerce sales and consumer engagement from it. “One of the biggest benefits so far for goodnessKNOWS has been that we can accelerate a process that we’ve typically done manually, to ultimately reach more brand-right consumers who are looking for a product like ours. Our Respondology campaign has enabled us to reach target-right consumers with relevant product messaging based on conversations they are already having online. We’ve seen a more engaged social community and a ripple effect of consumers sharing their love for our brand and product,” says Eric Epstein, Marketing Director of Snacks for Mars Wrigley Confectionary. The potential for turning endless amounts of consumer data into actionable marketing campaigns, provide personalization at scale across multiple channels and drive increasing efficiency within marketing teams are key for brands and retailers competing in today’s hyper-commoditized landscape. As AI experimentation continues in these areas, it will be important for brands and retailers to select the right technology partners, be willing to try out new strategies and ultimately, figure out what does and does not have an impact on their bottom-line, at speed. AI for what? How can AI help your organisation? What business problem are you trying to solve? AI is good at targeting ads, product recommendations, deciding if someone is likely to repay a loan, face and voice recognition, even driving cars. AI is not good at more profound thinking such as creativity and innovation. The economics of your business can help guide you to areas where AI can add value. Customer acquisition, conversion and retention are good places to start. Consider the whole customer journey. Anything that you can automate is a good candidate for AI. Gartner forecasts that by 2020, customers will manage 85% of their relationship with the enterprise without interacting with a human. That will require a lot of automation. AI can help with the necessary personalisation of targeting, content and customer journey. Optimising those three things in real-time is better suited to AI than a human being. Benchmark your competitors and similar industries for potential AI applications. One of the reasons AI is not more developed is that many organisations are yet to work out what they can do with AI. With AI answers are easy, it’s the questions that tend to be more difficult. The increasing power of computers and the greater availability of digital data have fuelled the growth of AI. First ask yourself if you can access the data you need to fulfil what you want to achieve with AI? Ideally you want a single customer view. Data silos can be a challenge. Data integration tools such as tag management and APIs are improving things but we still have a long way to go. Data is often the largest part of an AI project. Two thirds of the work in data mining projects is typically data preparation. As with all things IT – rubbish in, rubbish out. Data quality is important. Data needs to be predictive. If you have lots of data variables, by the time you add the last variable it is less likely to add much value to the overall AI solution. The answer may have already been found with the previous data. Data gives diminishing returns, especially if it is all saying the same thing. For example, customer databases in the financial services industry normally contain lots of wealth indicators. Ideally you want different types of predictive data. Sustainable competitive advantage and barriers to entry tend to be data rather than AI related. Data is easier to protect than AI. Data is less easy to copy than an AI algorithm. You do not need to own all the data, just enough to put competitors off from copying you. AI needs people to make it work. Similar to how digital started, develop a centre of excellence. Centralise your AI task team. Then over time integrate AI resources into the business units. Recruiting and retaining AI people is hard. Good analysts are like gold-dust. You want people who are good with numbers and analysis, communicate well and understand your business. Not an easy combination to find. Do you use internal or external personnel? It’s often best to pilot AI externally and over time bring proven AI value in-house. External resources may be more flexible and knowledgeable about the many different AI possibilities. Internal resources will work out cheaper and may be better at optimising your AI solutions in the long run. Building an AI capability is not a short term project. It is a long term process. Changing your organisation’s culture to embrace and leverage AI takes time. Initially keep it simple. Walk before you run. Start with quick wins to build corporate confidence. Things change so AI algorithms need to be regularly updated. You need an optimisation process to continually improve them. ROI is obviously important. The incremental improvement AI brings has to outweigh the total costs of implementing AI. That is why testing is vital. AI is ideally suited to digital businesses that have developed an agile, data driven, test and learn culture. Last but not least, which AI platform? I say last because the choice of platform should only come after the four Ps above. Don’t rush into the mistake many marketers make of buying the latest technology and then wondering why it has not fixed the problem. There are many AI platforms available from cloud providers such as Amazon, Microsoft, Google and IBM to many new start-ups. Which of the numerous tools available is best for your organisation will become clear over time. And you do have time. AI is not built in a day. It’s much more important to grow a strong AI capability than finish a few quick and dirty AI projects. AI is poised to unlock incredible value for marketers. Define your goals, then test and optimise your AI processes. Develop talented people who can capitalise on AI. The next industrial revolution will come when enough smart people start asking the right questions about what AI can do.